Since Thursday when they were forced to pass the tricky northerly extremity of the ice limit that required repeated gybes to stay north of 51°S between 120 and 150°W, the VO65s have been served up a proper dose of Southern Ocean sailing for the final 1700 mile run towards Cape Horn. The wind has been consistently at 30+ knots out of the west or northwest, enabling the crews to play the shifts to get south when the wind has backed, causing some different strategies to be played. That was until late Saturday afternoon UTC when they all converged at around 56°S 97°W and turned their bows, finally, for Cape Horn. At this point Dongfeng Race Team was out in front, around four miles ahead of second placed Team Alvimedica, the two boats having previous gybed southeast earlier than Abu Dhabi Ocean Racing and Team Brunel. Alvimedica in turn was around 6.5 miles ahead of third placed MAPFRE with ADOR and Brunel a further five and eight miles astern respectively. Since then the drag race to the Horn has been taking place with Dongfeng and Alvimedica holding the most northerly position while ADOR has been furthest south, some 22 miles away from them. Team Alvimedica overhauled Dongfeng Race Team to take the lead in the early hours of Sunday morning (UTC) and had pulled out a five mile lead over Dongfeng and MAPFRE mid-morning Sunday. However overnight ADOR has benefitted from more pressure in the south and as MAPFRE and Team Brunel have dropped back, Ian Walker's team has pulled up to second place, albeit still some 21 miles south of Team Alvimedica. MAPFRE and Team Brunel may have eased off the gas following Dongfeng Racing Team breaking the top of their mast off earlier this morning. The Franco-Chinese team has had repeated mast track issues over the course of the race and one wonders if these two things might be related? Anyway - sad to see Charles Caudrelier's team in trouble. 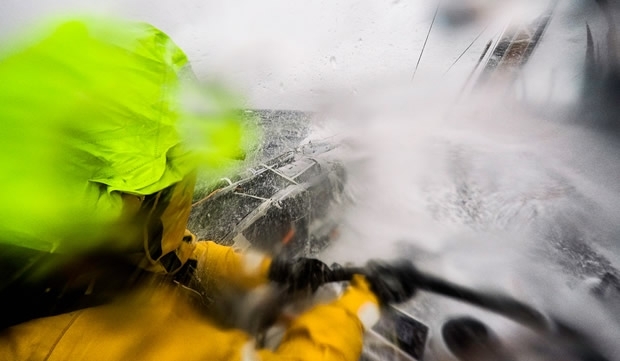 Theirs has been one of the great performances of this Volvo Ocean Race and this incident will obviously cost them their position as joint leader overall in the race. Meanwhile the race goes on and the boats have been eating up the miles since Saturday afternoon. Over the 24 hours leading up to 0642 UTC this morning Abu Dhabi Ocean Racing had covered 543 miles. Although this has some way to go to reach Ericsson 4's record of 596.6, it shows that the shorter more tippy VO65s are currently close to their maximum pace and its likely that there will be more to come from ADOR over the course of today. At 0640 UTC this morning, Team Alvimedica was 156 miles from Cape Horn, with ADOR in second, 163 miles behind, with Team Brunel and MAPFRE a further four miles behind Walker's team. At their present speeds the boats will be passing the Horn over the course of this afternoon. Tonight as they reveal whether or not they are passing through Le Maire Strait or not, the wind is forecast to drop before veering into the northwest or NNW and building back up to gale force once again over Tuesday night. Team SCA seems to have suffered the most from the Chinese gybes that occurred to the boats early last week having severely damaged their fractional Code Zero, that would have been their sail of choice in the present conditions. Now that we’ve all more or less settled in for a long port tack run to the east the big question on everyone’s mind is just how hard to push. There’s almost nothing between the top five places and it’s going to turn the final 800 miles to Cape Horn into a glorified drag race. If there’s anything we’ve learned so far this race it’s that the leaders aren’t afraid to redline the revs when challenged. But we were the leaders today, too, and everyone’s wondering if we just need to be pushing harder all the time. But it’s not a race to the Horn and with a forecast that’s showing 25+ knots for the duration of the distance there—and sometimes much more--when and where to start backing off is a point of significance. Obviously we feel fast. As fast as anyone. And when you feel fast nobody wants to slow down because in the back of the mind we’re telling ourselves we can be first to the Cape. But this leg will be decided along the coast of Brazil and if we push too hard now we may never give ourselves that chance. So do you send it? Claim it? Have total confidence in the stronger boats and go for gold? Or do you be rationally mature beyond ambition and resign to keeping everything together until it matters most? It’s something we’re working through and fortunately Will and Stu are here to weigh in on the merits of past experience. It’s a never-ending discussion: when to drop the hammer and when to reel it in. The quick synopsis: when the sun is up and the winds allow for it we’re pushing very hard. As soon as things get dark and unpredictable we bring it back, and quickly. That’s a compromise but we do have faith in our speed and self-preservation still remains priority numero uno!